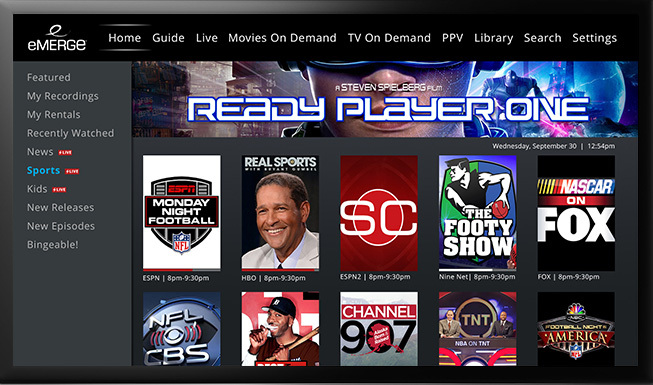 CENTENNIAL, Colo., October 2, 2018 – Evolution Digital today unveils its operator-customizable eMERGE app-based software client that seamlessly integrates pay-TV operators’ IP video services, enabled by eVUE-TV, including live linear, Video on Demand, pay-per-view and network DVR recordings, with OTT streaming content. The aggregation of these video offerings allow consumers to discover and stream their favorite content on a single user interface. 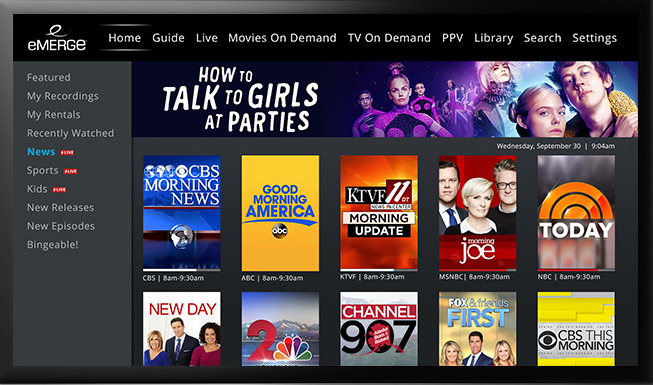 The customer’s eMERGE experience starts at “home,” featuring operator-curated high-value content including live, on demand, new release movies, recordings and OTT shows. Evolution Digital’s eMERGE gives operators the tools to modify and customize categories, campaigns and featured content. As a fully-integrated software client, eMERGE offers to operators the ability to upgrade their user interface and experience with advanced trick play features like catch-up and start-over viewing. And, with functionalities like deep linking and universal search, consumers can easily navigate and browse the content they’re looking to watch without ever having to leave the eMERGE app. eMERGE is available on operator managed set-top boxes, like Evolution Digital’s eSTREAM 4K™, powered by Android TV™, as well as retail devices including Roku®, Apple TV®, iOS® and Android™ mobile. More compatible devices will begin rolling out in the coming months. eMERGE’s pay-as-you-grow model secures an appropriate and scalable deployment schedule to operators. Evolution Digital’s video management and delivery platform, eVUE-TV, combined with a fully-integrated IP video software client, eMERGE, offers operators a one-stop shop, minimizing complexity and reducing costs that are associated with multi-vendor integration. eMERGE accelerates the operator’s customer acquisition and return on investment at a fraction of other competing solutions’ offerings. Additionally, Evolution Digital’s eMERGE app-based software client provides a clear path for universal browse, dynamic ad insertion, non-traditional video sources, as well as future IP telecommunications services such as the Internet of Things (IoT). Evolution Digital will announce eMERGE operator customers in the coming weeks. To find more information on eMERGE, visit www.evolutiondigital.com/emerge-user-interface. Evolution Digital L.L.C. is a leading provider of integrated IP video solutions, enabling its customers to provide products and services to compete in the highly-competitive pay-TV marketplace. Evolution Digital takes an aggressive approach in innovation to embrace the way viewers are consuming video, and has quickly become an innovator in the era of OTT content and multi-stream households. Evolution Digital’s end-to-end IP video delivery solutions offer an unparalleled user experience, available on managed set-top devices, third-party streaming platforms, smart phones and tablets, subject to the operator’s licensing agreements. Visit www.evolutiondigital.com.